When astronomers confirmed the discovery of an Earth-sized world orbiting Proxima Centauri just 4.25 light years away, hopes were ignited that there may be more planetary real estate in our cosmic neighborhood. To find out, a team of ex-NASA scientists is now seeking private funding to scour the Alpha Centauri system for habitable planets. This week, the nonprofits BoldlyGo Institute and Mission Centaur launched Project Blue, an ambitious effort to discover Earth-like worlds around Alpha Centauri A or B, by building a small, space-based telescope capable of photographing them. It’s a high-risk, high-reward endeavor with no guarantees of success; not the sort of mission that tends to make it through NASA’s belabored screening process. Which is why, in what some scientists are calling a sign of the future, Project Blue is counting on private investors to make it happen. “There’s this new space energy out there now, with a lot of privately funded science going on,” BoldyGo CEO Jon Morse told Gizmodo. Morse, who left his job as head of NASA’s Astrophysics Division in 2011 because he wanted to “go out and try to do something really hard,” believes that the time is ripe for exoplanet science to take its next big leap forward. 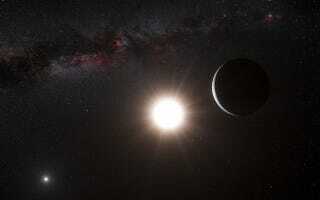 “We want to be the first ones to directly image an Earth-like exoplanet around a Sun-like star,” he said. If funded, his two-year mission to do just that could launch by the end of the decade. Located roughly 4.37 light years from Earth, the Alpha Centauri system—consisting of two Sun-like stars, Alpha Centauri A and B, and the cooler red dwarf Proxima Centauri—has captivated imaginations for decades. From golden age classics to Kim Stanley Robinson’s recent hit novel Aurora, science fiction often portrays Alpha Centauri as the next logical place our species will migrate. Many professional scientists happen to agree. “Our sun will die in several billion years, and when that happens, we’ll need to relocate,” said Avi Loeb, chair of the Harvard-Smithsonian Center for Astrophysics. But before we wave off a generation ship full of colonists, or even a fleet of nanoprobes, there’s one thing we really ought to square away: Does Alpha Centauri actually have habitable planets? Somewhat surprisingly, given the thousands of exoplanets we’ve discovered of late, this hasn’t been an easy question to answer. For years, astronomers have been probing this neighboring star system using the radial velocity method, which attempts to ascribe tiny wobbles in stellar light curves to the gravitational tug of planets. In 2012, a group of astronomers thought they found a planet orbiting Alpha Centauri B, based on the star’s wobble. They even wrote it up in Nature, and garnered quite a bit of publicity. But follow-up observational campaigns called the discovery into question. Eventually, the “evidence” for Alpha Centauri Bb’s existence was chalked up to spurious data. Last year, a Hubble survey of Alpha Centauri B yielded evidence for a transiting exoplanet; one that crosses the star in our line of sight and produces a shadow. But again, there was nothing conclusive. Despite frustrations and setbacks, there’s still a great deal of interest in exploring the habitability of Alpha Centauri A and B, which could in theory harbor rocky worlds similar to Earth. And of course, we got some very encouraging news a few months back, when it was announced that there is a rocky, habitable-zone planet at Proxima Centauri—although whether life could really survive around a red dwarf star remains to be seen. The best way to settle the question of whether pale blue dots lurk around Alpha Centauri is try and capture photos of them. But directly imaging exoplanets, which emit millions of times less light than their stars, has proven maddeningly difficult: it’s often compared to spotting a firefly next to a lighthouse from ten miles away. To date, astronomers have only managed to image behemoth gas giants in distant orbits, and while we’ve learned a lot from these planets, they’re not exactly ideal places for life to take root. But Alpha Centauri A and B are hotter, brighter stars, and their habitable zones lie further away. Meaning, if we do find a promising target, it’ll be in a more distant orbit, where starlight is more easily blocked. It still won’t be easy to snap a pretty picture, but Morse and his team at Project Blue believe a fuzzy blue dot is within reach. Morse reckons Project Blue’s telescope will cost $25 to $50 million to build and launch, which is considerably cheaper than your average NASA mission, but still a hefty chunk of change. “The mission is modest enough that you can do some serious initial design work with a successful crowdfunding campaign,” he said, adding that when it comes to actually building the scope, the project will need to attract some “high net worth individuals or foundations.” Partner institutions, like SETI Institute, may also contribute in the form of technical expertise. From its inherently risky nature to its narrow focus and ambitious timetable, Project Blue represents a radical departure from the multi billion-dollar, decade-long outer space ventures that NASA has rendered almost synonymous with the word “mission.” Privately backed space exploration is a new, untested model, and there are no certainties, neither at the level of funding nor discovery. But Morse figures he’s got a pretty good shot of finding something. After all, we know from Kepler that most stars have planets, and that a decent fraction of planets are in the habitable zone. With Alpha Centauri A and B, we’ve got two chances. Of course, if we do find another pale blue planet out there in the void, it’ll become a prime target to follow up on with bigger missions, like the James Webb Space Telescope and the next generation of extremely large telescopes (ELTs), which may be able to probe a nearby world’s atmosphere in more detail. Loeb, for his part, it not yet convinced that a small space telescope can do a better job finding Earth-like planets around Alpha Centauri than an enormous ground-based telescope will in the 2020s. But he is not surprised at all to see astronomers striking out on their own to give it a try. Let's Go to Alpha Centauri!